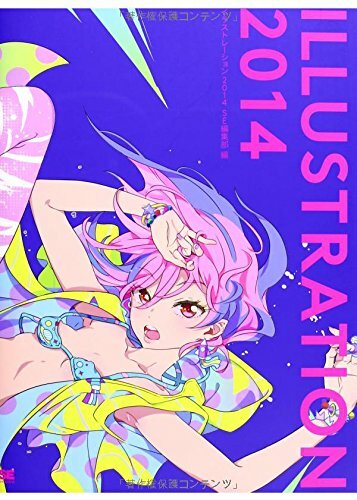 ILLUSTRATION 2014 イラストレーション 2014 is the yearly annual artbook that features Japanese style illustrationa. This should be a new series because there's only one earlier volume for 2013, ILLUSTRATION 2013. Both are worth getting if you want to check out upcoming Japanese artists and trends in Japanese art. ILLUSTRATION 2014 is a 320-page paperback that features 150 artists with a huge variety of styles to check out. Each artist only has two pages, with one full page illustration and 3 to 4 on the other page. There's the artist profile with website included so you can follow up. Most artworks are character based. One of the things that caught my eye about the book is the use of colours. The artists are not afraid to use striking or unusual colour palettes. Another book worth checking out which is quite similar is the Pixiv Almanac Volume 1.